The BIG CHEESE! | Winners Drink Milk! “Who doesn’t love cheese! ?” exclaimed Sarah Kaufmann, nationally renowned cheese sculptor. “And this will be a really BIG hunk of cheese!” More than 1500 pounds of Indiana-produced mild cheddar cheese, along with a few other favorites, such as Gouda and white cheddar, will be sculpted into an amazing work of art portraying the NFL and National Dairy Council’s in-school based program, Fuel Up to Play 60. Artist Sarah Kaufmann, one of only three known cheese carvers in the US, was commissioned for the fifth consecutive year by the American Dairy Association of Indiana (ADA) to create the sculpture, entitled Fuel Up to Play 60, encouraging the availability and consumption of nutrient-rich foods, along with 60 minutes of daily physical activity for all school-aged children. On opening day, Kaufmann will begin carving two 640-pound blocks of mild cheddar cheese from Pace Dairy in Crawfordsville, IN into an amazing work of art that will measure an estimated 7 feet wide by 3.5 feet high. In just five days, this unique masterpiece will come to life with the image of Colts mascot, Blue, and buddy playing football on the turf at Lucas Oil Stadium with a crowd cheering them on in the background. Once completed, the sculpture will remain in a large refrigerated case at the east end of the Pioneer Our Land Pavilion. 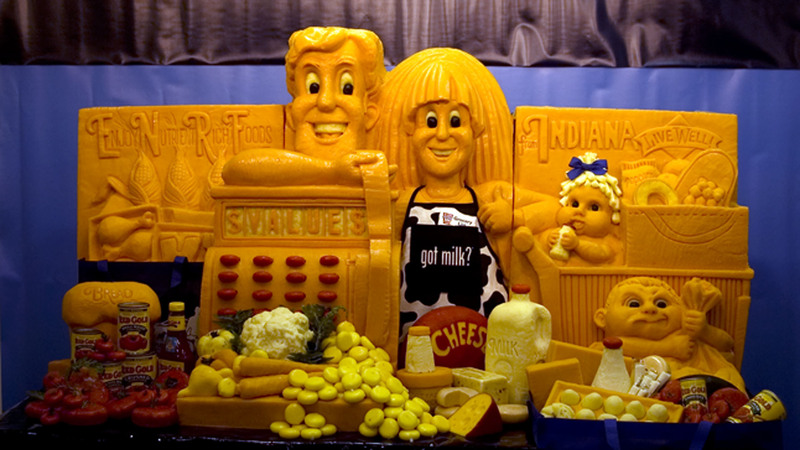 Kaufmann, known nationwide as “The Cheese Lady,” is a Wisconsin native who now resides in suburban Cincinnati. She began sculpting cheese in 1995. Among her creations are a 10-pound Mozart violin, a 120-pound Mickey Mouse, a 640-pound Green Bay Packers player, and a six-foot long University of Florida Fighting Gator. At the 2006 Indiana State Fair, she was commissioned by ADA to create her largest sculpture ever: a 2334-pound work that depicted the fair’s rich 4-H and agricultural heritage in honor of the event’s 150th anniversary. In 2007, Sarah created a sculpture celebrating the Indy 500 Victory Lane Bottle of Milk Tradition. In 2008, she commemorated the installation of the fair’s covered bridge. Last year’s sculpture saluted Indiana Dairy Farm Families and the hard work and dedication they provide for Hoosiers, Every Single Day. Famous “celebrity heads” she has been commissioned to sculpt over the years include late night talk show hosts David Letterman and Jay Leno; racing legend (and 1969 Indy 500 champion) Mario Andretti; actor Paul Newman; TV journalist Katie Couric, and many others. The cheese sculpture will be on display in its refrigerated case throughout the run of the State Fair, which ends Sunday, August 22. The dairy industry ranks as Indiana’s fourth largest agricultural concern. The American Dairy Association of Indiana, a not-for-profit organization representing the state’s dairy farmers, annually sponsors and operates the popular State Fair Dairy Bar located opposite the Coliseum between the fair’s administration building and the Grand Hall. The Dairy Bar menu offers a variety of items including thick, delicious milkshakes, grilled cheese sandwiches, ice cold white and chocolate milk, ice cream and frozen custard, fried mozzarella sticks, bagels, danish, breakfast biscuits with egg, sausage and cheese, and in honor of this year’s State Fair theme, the Chocolate Pig – making it the perfect spot for fairgoers to get their FDA-recommended 3-Every-Day of Dairy. The Dairy Bar is open throughout the fair from 8 am to 9 pm daily.